"I am free now and choose to remain so." These are the words that haunt the new exhibit, "The President's House: Freedom and Slavery in Making a New Nation." Now, directly in front of the famous Liberty Bell and Independence Hall, the President's House is the first and only federal site designed to memorialize enslaved African Americans. That defiant affirmation of freedom was uttered by Oney "Ona" Judge, a runaway slave formerly owned by George and Martha Washington who successfully evaded the first president's many attempts to capture her. It is her story, told through a video reenactment, that introduces the exhibit. In it, an actress playing an older, bonnet-clad Judge recounts how she stole her freedom from the man who helped this country secure its own independence. Directed by independent documentary filmmaker Louis Massiah and written by novelist Lorene Cary, Oney's story appears alongside several other video vignettes. Hung like paintings over brick fireplaces are flat-screen video panels featuring black actors in period costumes, narrating the stories of nine enslaved African Americans — all of whom worked for and lived with the country's first president when Philadelphia was the nation's capital. It is these colliding tales of American freedom and black enslavement, of fugitive slave laws and an interracial abolitionist movement, that are at the heart of the President's House, a $11.2 million, open-air structure that opened last year to much fanfare and controversy on Dec. 15. As the first "White House," the President's House was the executive mansion of Washington and John Adams, the nation's first two presidents. In 1947 Congress designated the building a historic site, but by 1952 it had been demolished. In 2002 it found new life when the public historian Edward Lawler Jr. published the article, "The President's House in Philadelphia: The Rediscovery of a Lost Landmark," in the Pennsylvania Magazine of History and Biography. Lawler argued that the house should be restored, rather than moving the Liberty Bell to the heart of Independence Mall and on top of the foundation of the President's House. Lawler's conjectured floor plans revealed both the modesty of the executive mansion as well as the small quarters to which Washington confined his slaves. The floor plans were vivid reminders that slavery and freedom lived side by side. The President's House, Lawler said, served as a more accurate symbol for America's complicated past than did the Liberty Bell. As Washington created the blueprint for American democracy, he held tightly to the reins of slavery. Initially the National Park Service contested Lawler's conclusions, especially those about the slave quarters, and refused to incorporate the footprint of the forgotten President's House into its designs for the $13 million Liberty Bell Center. In 2002 an interracial contingent of scholars and activists, including Gary B. Nash, author of The Liberty Bell, and Michael Coard and his Avenging the Ancestors Coalition, launched a public campaign demanding that the slave quarters be commemorated. In 2007 an archaeological dig revealed the house's foundation and the remains of a tunnel once used by servants and slaves. Drawing more than 300,000 visitors to the dig, the remains of the kitchen and corridors where slaves toiled were incorporated into the final design. Led by African-American architect Emanuel Kelly, the firm Kelly/Maiello Architects & Planners designed the unfinished, open-air brick house. Inside the doorless frames to the exhibit are images and facts about its famous residents, which included the Washingtons and John and Abigail Adams. A granite wall plaque is dedicated to nine of Washington's slaves, most of whom are known only by a single name: OneyJudge, Austin, Christopher Sheels, Giles, Hercules (another escapee from the President's House), Joe Richardson, Moll, Paris and Richmond. But it is Judge's story that is the best known. Her 1796 escape garnered her a considerable amount of attention from contemporary newspapers. She was inspired by both the American and Haitian revolutions and aided by black and white abolitionists alike. 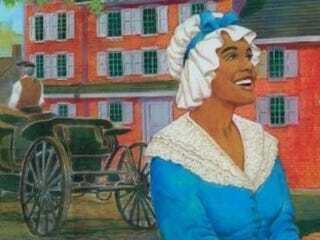 Her story is now the subject of a children's book, The Escape of Oney Judge. Last May the museum celebrated "Ona Judge Freedom Day" to commemorate the 215th anniversary of her escape. As president, George Washington denied enslaved African Americans their legal right to right to freedom by skirting the gradual abolition law in Pennsylvania. This law required owners to free adult slaves after six months of residency in the state; Washington evaded the law by rotating his slaves between his Mount Vernon and Philadelphia homes. As an escaped slave, Judge posed a great threat to Washington's system, so he tried, first through persuasion and then coercion and trickery, to get her to return to Philadelphia. Steadfast in her belief that she deserved to be free, Oney refused to return to the Washington home because she knew that she would eventually be bequeathed to Martha Washington's cruel granddaughter, Eliza Custis. Listening to Oney's testimony, culled from an 1845 interview published in the Granite Freeman, is no less inspiring than reading the Declaration of Independence, written one block away. Judge's story illustrates the competing stories of freedom that birthed the new American republic. Salamishah Tillet is an assistant professor of English and Africana Studies at the University of Pennsylvania, author of the forthcoming Peculiar Citizenship: Slavery and the Post-Civil Rights Imagination and co-founder of the nonprofit organization A Long Walk Home, Inc. Follow her on Twitter.